Did you lose your toned cat? Imagine you hold a coin in your hand and your palm is facing downward. You get to keep the coin because your muscles are tensing. Open your hand and relax your muscles, the coin drops. This is a cycle of grasping and letting go I routinely see in my office. People feel a tight sensation so they let go of their muscles to release the tension. The loose muscles can’t protect their joints so the body reflexively tenses. And this tense loose cycle goes on and on. What if you turned your hand upward before opening your grasp? The coin stays in your hand1. At Third Way Chiropractic we teach you to use your muscles to build this place between grasping and letting go. There are three zones of muscle tone; loose, toned and tense. Muscles that are engaged and toned work the best. You can tell if you muscle is engaged with tone because you can control the muscle by actively squeezing and lengthening it. This is the zone where moderate stretching works. Letting go of the muscle creates a low tone, loose muscle. Low tone muscles are not available to move your body and protect your joints. Often a muscle that is overstretched feels tight and tense. Stretching a tense muscle causes the muscle to be tighter. Stretching a muscle that is already at the end of its range of motion causes a breakdown in the muscle and the joint. Your muscles have physical properties similar to a rubber band. 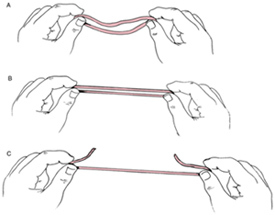 Think about the mechanics of a rubber band demonstrated in the picture to the left2. Picture A show a loose and lax rubber band. Picture B shows a rubber band with ideal tone. Picture C shows a rubber band stretched to the point where it could snap. Healing happens as you try to recognize whether your muscle tone is loose, toned or tensed. This is the starting point to actively controlling how your muscles squeeze and lengthen. You brain will eventually regain control over your muscles. Your muscles are not just a rope. It is common to think stretching fixes tight muscles. This can set up the situation where you are injuring your muscles and joints while trying to help a muscle that feels tight. It is safer to stop stretching so hard and learn other ways to heal your muscles. This is often frustrating in the beginning. Stick with it and learn at the rate where you form new patterns of thinking and muscle control. If you are not getting better from stretching, why not rebuild a muscle zone that supports you in a new way. You can learn the muscle tone zone. Now smile at that cat.